In Japan, red lanterns hanging in a shop window signify that you’ve stumbled upon an izakaya, a casual pub specializing in shareable small plates. It’s the national equivalent of Spain’s tapas bars. 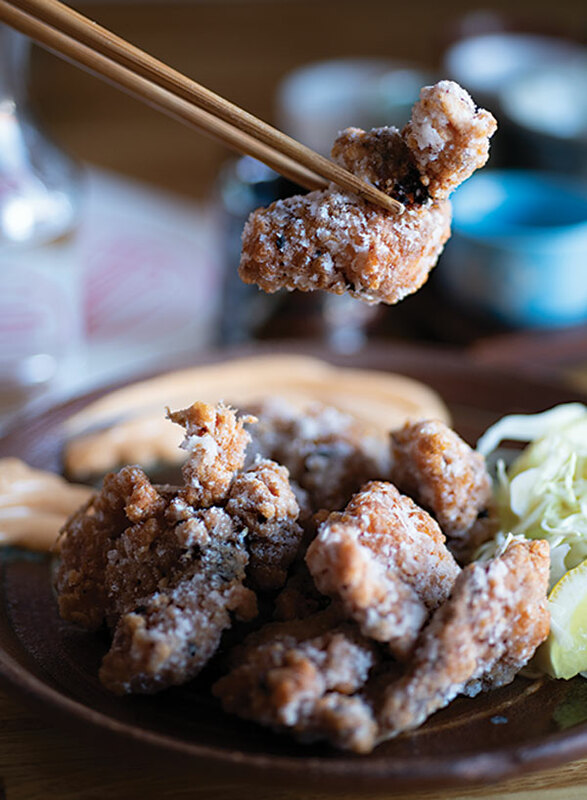 In Portland, the warm glow from the red lanterns at Izakaya Minato invites passersby in for a tantalizing sensory experience — the sizzle of frying chicken thighs, the savory aroma of fish broth, the blur of cooks and barkeeps. Husband-wife owners Thomas Takashi Cooke and Elaine Alden opened the East Bayside spot last year. For almost a decade prior, they worked together in a Japanese restaurant in San Francisco. Then, with an eye toward opening their own place, they spent three months living with Cooke’s mother in Tokyo, where Cooke trained in a local izakaya. Izakayas are meant to be hopping hangouts, so the pair decided on a simple, soothing aesthetic that carries from the bar to the dining room. Blond-wood bar and tabletops, white walls, and gray trim keep the compact space from feeling too crowded even when it’s jam-packed on weekend evenings. Earth-tone ceramics, from soup bowls to sake cups, fit the look nicely — and they’re hand-spun by Cooke, who’s been spending his one day off each week taking pottery classes down the street. From behind the counter, where kitchen and bar staff work side by side, a constant and extensive array of dishes flows. Those fried chicken thighs, dredged in potato starch, are at first crunchy and then oh-so-juicy, and they get a little kick from a smear of spicy mayo for dipping. And that savory fish broth floats a big, chewy rice ball that’s topped with either salmon roe or umeboshi, a pickled plum-like fruit common in Japan. Bartenders oversee a thorough list of sakes and Japanese whiskies that Alden curates. She developed a keen palate for sake while working in San Francisco and continually hones her lineup to cover the stylistic bases. Tensei “Endless Summer” Tokubetsu Honjozo, for instance, is bright and refreshing, while Minato Yamahai Nama Genshu, a high-ABV, unpasteurized sake, possesses deep, earthy flavors (and, coincidentally, shares the minato name with the restaurant — that’s “harbor” in Japanese). Every dish brings a fresh set of tastes and textures: smoky bacon-wrapped rice cakes, melt-off-the-bone Korean-style barbecue short ribs, spicy kimchi fried rice. The broiled black cod, marinated in sake lees, is nearly the consistency of butter. Fried tofu squares, with jalapeño, soy sauce, and bonito, addictively marry spicy and salty — I suspect I could snack on these all day. 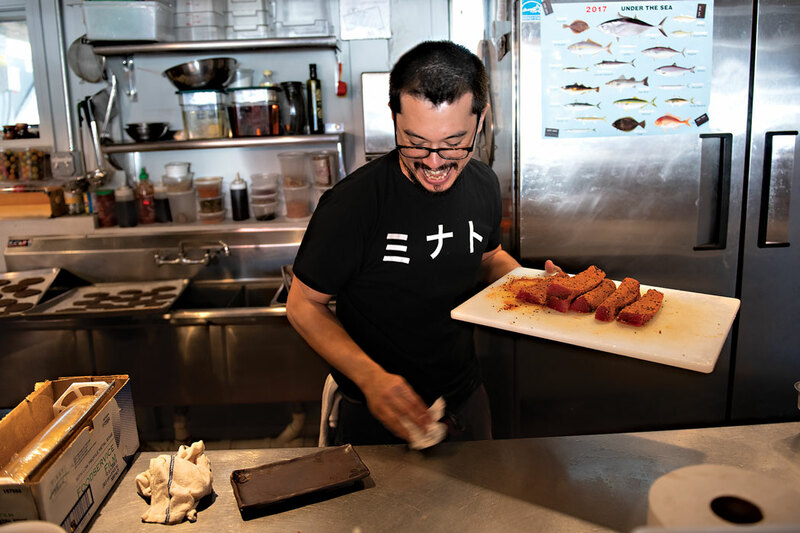 The menu’s range — and the careful execution of every dish — sets Izakaya Minato apart from other small-plates establishments. Cooke’s stylish presentation of sashimi is as spot-on as his messy plate of okonomiyaki, a cabbage pancake with bonito and either bacon or mushrooms (I side with bacon). Every dish, once set in front of you, seems to transcend its menu description. It’s almost a shame that, with 20-plus options to choose from, a few plates per person will leave you sated. Of course, you could always opt to cede control and order the chef’s-selection dinner, letting the kitchen surprise you, or you might recruit enough friends to share and sample the whole menu. At such a relaxed and convivial place, there’s no wrong way to order.